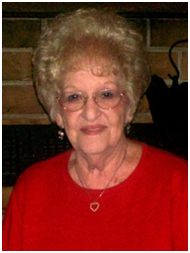 Marcia Merle (Ashley) Johnson, age 89, of El Dorado Springs, NO, went to her heavenly home March 13, 2013. Marcia Ashley was born May 12, 1923, near Leesville, Missouri, in Henry County. She was the first child born to Virgil Lee (Jack) and Myrtle Opal Carleton Ashley. She spent her youth growing up on the farm living in close proximity to both her Ashley and Carleton families. She often spoke of the love she had for her Grandfather Silas Lee Ashley and how much he really loved all the grandkids. She attended Leesville grade school and graduated from Coal High School in 1942. Marcia was the President of her graduating class, Editor-in-Chief of the yearbook, Senior Queen of the Carnival, member of the Athletic Booster Club, sang in the Christmas Cantata and Music festival, played Aunt Paradise (the colored cook) in the Junior-Senior play “Hoodoo” and was in the play “All A Mistake”. She was described in her Senior Yearbook as “The attractive blonde Senior President, very agreeable, her favorite saying being “Oh Gump”. She and her family were very active members of the Tebo Baptist Church, being especially involved in all the church music. After graduating she went to the Kansas City area to work for a short time, living with her uncle Walter Carleton. Returning to Clinton she worked for the Blue Room Restaurant, the Chicken Hatchery, and a Dentist. She met a young man shooting baskets at Coal High School and later married this young man Leo Amos Johnson on September 4, 1943. After the birth of her first child in 1944 she spent 34 years being the best stay at home Mom and wife anyone could ever ask for. Having her children raised she went to work at Evan’s Rexall Drug Store in El Dorado Springs, Missouri where she became an irreplaceable employee for Elton Evans. Elton once told her she was the best worker and friend he had ever had. She took up painting and many of her family have some cherished memories, in the form of her great artwork. Marcia and Leo loved to dance and sponsored several Teen Town events, where all of the kids would be in awe of their dancing moves. They had many great friends from Clinton and El Dorado Springs that they spent time with, boating on the lake, dancing, Branson vacations and many other fun things. She was a great cook, always took pride in her appearance, and was “Loved” by all who met her. Some of the businesses that Marcia and Leo partnered were, Johnson Brothers Hardware, in Clinton, MO., Deepwater Chrysler/ Plymouth car dealership in Deepwater, MO., Ford Motors dealership, El Dorado Springs, MO., several used car dealerships in El Dorado Springs and Collins, MO., and Pool Halls in El Dorado Springs and Stockton, MO. Marcia was a member of the First Baptist Church in Clinton, MO., and the First Baptist Church in El Dorado Springs, MO. Marcia was preceded in death by her parents Jack and Opal Ashley, and husband Leo Johnson. Marcia is survived by two sisters: Glenna Hudson and Jeannie Mansfield of Calhoun, Missouri; her children: Larry and wife Sharon of Neosho, MO. ; Michael Johnson of Viburnum, MO. ; and Sheri and husband Terry Proctor of El Dorado Springs, MO; grandchildren: Renee Johnson of Neosho, MO; Aaron Johnson of Gilbert, AZ; Benji Deckard of El Dorado Springs; Ashley and husband Billy Daniels Jr. of El Dorado Springs; and Matthew Johnson; great-grandchildren: Kaylin Johnson of Neosho, MO. and Khloe Daniels of El Dorado Springs, MO; and many nieces and nephews. Funeral services were held on Saturday, March 16, 2013, at 2:00 p.m. at Bland-Hackleman Chapel with Rev. Brent Bland officiating. Burial followed in the El Dorado Springs City Cemetery under the direction of Bland-Hackleman Funeral Home. Pallbearers were: Aaron Johnson, Billy Daniels Jr., Benji Deckard, Terry Piepmeier, Robert Hudson, and Randy Mansfield.